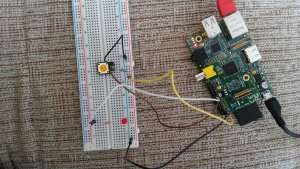 The raspberry pi is a single-board computer developed in the UK by the Raspberry Pi Foundation with the intention of stimulating the teaching of basic computer science in schools. The design is based on a Broadcom BCM2835 system on a chip (SoC), which includes an ARM1176JZF-S 700MHz processor, VideoCore IV GPU, and 512 megabytes of RAM. The design does not include a built-in hard disk or solid-state drive, instead relying on an SD card for booting and long-term storage. We buid our circuit as the picture shown below. Button to a leg (does not matter) -> 16.p the -> 1k resistor ->’re doing 1.p the connections. The other leg of the button -> GND ‘s (6.p a) attribute. LED’s plus end (the long leg) -> 220 ohm resistor ->’re doing 18.p the connections. LED’s negative end (short leg) -> GND ‘s (6.p a) attribute. We can go by that part of the code circuit boards. 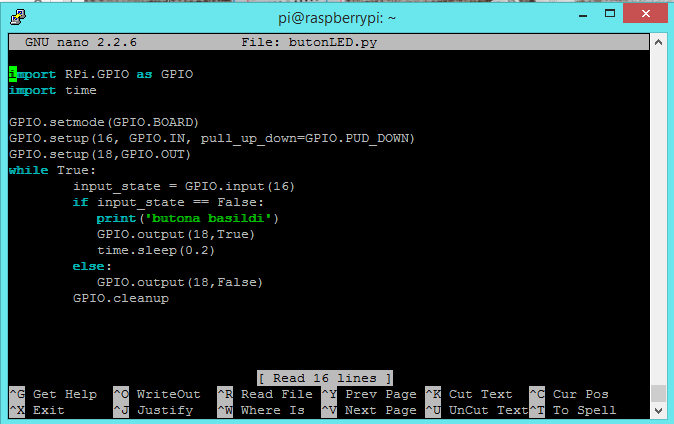 As we reach Raspberry Pi terminal described in our previous article. To create a new file for a python terminal sudo nano butonled.py We run writing. We write code from the screen, as shown in the picture below.